Amazon is raining the quizzes as deals again. Answering 5 questions to win an amount of Rs 4000 is not at all big task. The task becomes easier when you have the answers. Isn’t it..?? Dealnloot has added all the answers here in this post. 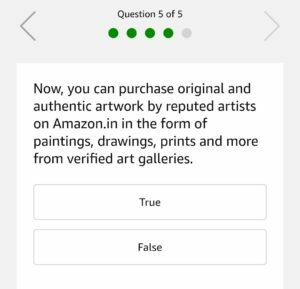 Amazon Art Quiz is a 5 Questions quiz related to arts and sciences. Go for it Now..!! 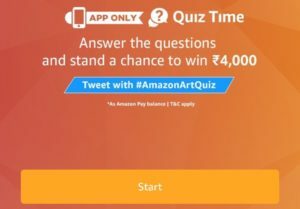 How to win Rs 4000 by answering Amazon Art Quiz ? 1. Who is the famous Indian painter who painted ‘Shakuntala’? 2. Which of these famous Indian painters was awarded the Padma Vibhushan in 1991? 3. Which of the following is NOT a traditional Indian folk art form? 4. Which of these famous painting by Leonardo da Vinci is also known as ‘La Gioconda’? 5. Now, you can purchase original and authentic artwork by reputed artists on Amazon.in in the form of paintings, drawings, prints and more from verified art galleries. 5. After answering all 5 questions correctly. That’s it. Just wait for the Winners list by 31st August 2018. All the best for Amazon Quiz Answers ..!! 1. This Contest will commence on 28th June 2018 from 12:00:01 a.m. (IST) to 25th July 2018 11:59:59 p.m. (IST) (Contest Period). 6. The declared winner(s) will be eligible to win Rs. 4,000 (hereinafter referred to as “Prize(s)”), which will reflect in the winner’s Amazon.in account as Amazon Pay Balance.